Honey beauty skin products recipes are an important part of all natural skin care. This is because honey is a great ingredient for proper skin care. It has been used for hundreds of years to keep skin healthy and looking its best. Honey is a wonderful natural moisturizer and skin hydrator that can be used to combat dry skin care problems. 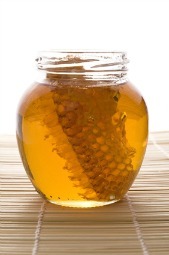 Honey is also a good and gentle exfoliant because it contains AHAs or alpha hydroxy acids. Honey contains antioxidants which helps fight skin damage caused by the elements and the sun and helps reduce the premature aging of skin. It can even act as an effective antimicrobial agent to fight off infections from minor cuts and scraps. The added benefit of using honey in skin care products is that it is very gentle on the skin. Therefore, even people with sensitive skin can utilize the many skin care benefits that honey provides. Healthy-skincare.com recognizes the valuable role that honey can play in beauty skin products and therefore offers an ebook containing many honey skincare recipes. This book contains recipes for a number of skin care products that you can make in your own home. Skincare recipes are provided for honey face and body scrubs, honey moisturizers, honey skin hydrators, honey skin exfoliators, honey skin balms, honey lotions for the face and body, honey skin cleansers, facial toners containing honey, honey masks, and honey facials. In addition, because honey provides so many benefits for the skin and body, you will also find recipes for hair conditioners, lip balms, lip gloss, foot treatments, and eye treatments. If you are into natural skin care and making your own skin care products, then utilizing honey is a must. Purchase the Honey Skin Care Recipes book for only $2.99 from Healthy-skincare.com. Other homemade beauty skin products recipes are available from healthy-skincare.com in ebook form. This skin care recipes guide contains many recipes for your skin care needs and overall body and health needs. Included in this ebook is a long list of homemade recipes as summarized below. Included in this section are recipes for bath salts, bath balms, bath oils, bubble baths, bath crystals, shower gels, and various types of exotic and relaxing bath formulas. A body toxin elimination bath recipe is also included. Here you will find many recipes for body powders, body oils, body and face and hand soaps, body washes, body scrubs, massage oils, body sprays and perfumes, and all natural deodorants. Beauty skin products recipes for homemade shampoos, hair gels, hair sprays, body hair bleaches, brittle hair treatments, oily hair treatments, dry hair treatments, and conditioners are provided. There are several recipes to make various lip balms and lip glosses for your lip care needs. Recipes are provided for certain skin care problems such as varicose veins, dandruff, stretch marks, fine lines and wrinkles, acne, and cellulite. In addition to all of the above beauty skin products recipes, this ebook contains recipes for an elbow softener, skin toners, moisturizers, hand lotions, hand creams, suntan lotions, invigorating foot lotions, facial masks, and hand masks. In this section, you will find recipes for making your own toothpaste, mouthwash, fingernail treatments, and a variety of other recipes that aim to relieve certain health problems. This ebook of Health and Skin Products Recipes is available from healthy-skincare.com for $4.99 US.